In 1830, President Andrew Jackson signed the Indian Removal Act. The act removed 90,000 Native Americans from the rich agricultural lands east of the Mississippi and relocated them on the Great Plains. At the time, the United States government did not believe that the vast grasslands had any settlement value. However, things would change rapidly. At the conclusion of the U.S.-Mexican War (1845-48), Texas and California would join the Union, and only a short time later gold was discovered in California. It didn't take long before a steady stream of settlers were traveling westward in search of their dreams. Almost always, the wagon trains gathered in cities like Independence or Kansas City, Missouri before making the 40 to 60 day cross country trip. These groups of wagons were largely occupied by European-Americans who mostly traveled to their destinations by way of the Santa Fe and Oregon Trails. Skirmishes between settlers and Indians soon became common. These constant skirmishes forced the government to come to terms with the Plains Indians. In return for safe passage of the settlers, the Sioux, Northern Cheyenne, Arapaho, and the Crow all agreed to accept an annuity payment of $50,000 for 50 years. In addition, they would occupy specific tribal lands. The money would not be paid in cash, but in food and goods instead. Everything went fine until 1854. During the late part of the summer of 1854, large numbers of Sioux were camped near Fort Laramie waiting for their annual payment. Food had been scarce the following year because the buffalo were being hunted into extinction. In part, the Sioux now believed that the heavy traffic on the Oregon Trail was driving the buffalo away. Then, on August 18th, a Mormon wagon train was traveling to Fort Laramie, when one of their cows was shot by a Sioux named High Forehead. Almost immediately, Chief Brave Bull went to Fort Laramie to settle things. He asked Lieutenant Fleming, to allow the matter of reparations to be settled by the Indian agent who was bringing them their annuity. Lieutenant Grattan, stepped in, and pointed out that their had been other recent incidents along the trail, and maybe they needed to be taught a lesson. Eventually, Fleming agreed, and he ordered Grattan to the nearby Sioux camp to arrest the man who killed the cow. Grattan arrived with 27 infantrymen, two officers, a fur trader, an interpreter and two howitzer cannons. Again, Chief Brave Bear asked that they wait and have the Indian agent solve the problem. When he realized he was talking to deaf ears, Brave Bear told Lt. Grattan that it wasn't a big thing, and he offered several horses to make up for the cow that apparently had already been eaten. However, Lt. Grattan was determined to take him in, and the more determined he became the more determined Brave Bear and High Forehead were that High Forehead was not going with them. 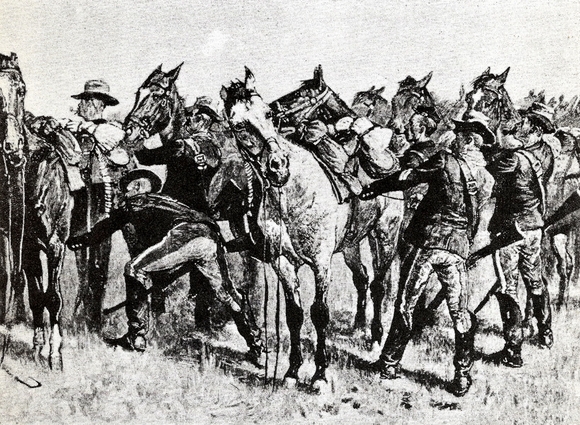 Suddenly, shots were fired, and both Big Bear and Lt. Grattan were wounded. Immediately, the soldiers attempted to flee back to safety of the Fort Laramie. Only one soldier, and the fur trader made it back alive to describe the “massacre.” Newspapers everywhere carried the story. This battle set off a 50 year conflict that historians call the Plains Indian Wars.